While searching for a reliable clinic to provide urgent care dentist services in a clean modern office with a very reliable staff, who gives great second opinions, and has their pulse on the future of dental advancements, Austin Family Dentistry is a great clinic for you. Head Dr. Gerald Mcdougal performs what each individual wants, and makes sure that it is well known that he won’t conjure up problems that don’t exist, or find suspicious cavities just to inflate the bill. Emergency services are available, you must call ahead to reach them ahead of time. This office is part of the “Zocdoc” network, where you can instantly book an appointment online. It is very simple, and if you are seeking for an appointment after hours or don’t have time to call, it is a very convenient way to make sure you get an appointment for emergency dental or routine services in Austin TX when it fits your schedule. 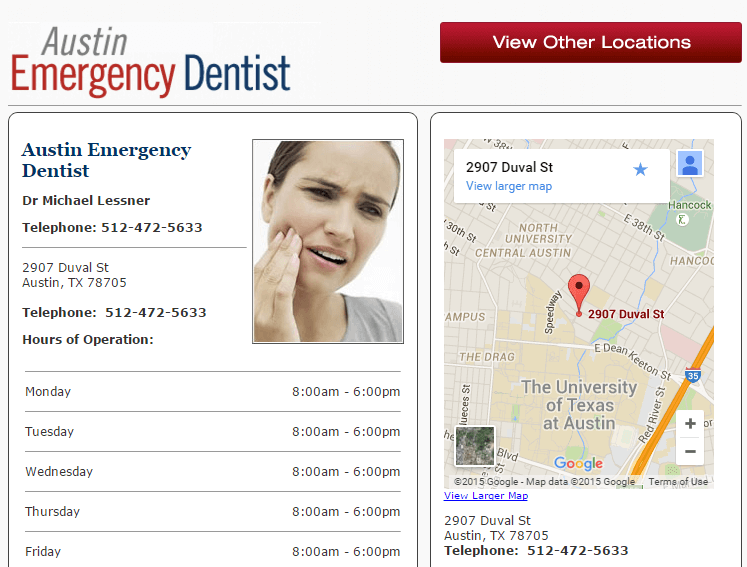 Find a great emergency dentist in Austin Texas today. What services are offered here? General, cosmetic, and advanced dentistry practices are all offered here. Many times folks will put off the routine check ups because they may fear the dentist or feel as if they don’t want to incur the expense. Many times when someone does this, they don’t realize the danger they may be putting themselves in for the future. Here are some of the things you can have covered here at Austin Family Dentistry: it won’t take long to get you smiling again, and frequently! On their website you can click on coupons that will provide special offers and discounts, another incentive to come here and get checked out right away. You don’t need to put it off any longer! 1. Free Exam or Consultation: Valid for new patients only, this cannot be combined with any other offer. 2. $100 off anterior root canals: Just print the coupon and bring to your appointment or show on your mobile device. 3. $100 off bicuspid root canals: Simply print the coupon and bring it to your appointment or show on your smart phone. 4. $150 off Molar Root Canals: Just like all the other specials: many of these teeth eventually need root canal therapy when they reach a certain point of infection or maturity. 5. $150 off all crowns: A very common procedure that many need done, you just print the coupon and receive this very commonly needed service. 6. $50 off ANY dental procedure: This is a great deal, as anything you encounter needing, will receive discount with presentation of coupon. 7. $350 Full Zoom Treatment: Zoom is an in-office whitening procedure that is very effective and popular. Just print the coupon or bring on your mobile device for service. He is absolutely correct when he states that good dentistry does not just happen, it comes from hard work, training, keeping up on many different technology types, and having a patient and listening ear. Having more experience than many others and the ability to diagnose whatever after hours dentist problem is ailing you, Gerald has a very caring bedside manner, and decades of experience to help him as soon as he figures out your most practical plan for dental health.